I think India is a country that is hard for Americans to relate to. I can't imagine what living in a country with so much history would be like. It would take a life time to study the people that came through just one small town there. We're a new country, we rarely look to the past. Even when we do try to look back it's only for 250 years. People have been in India for 3000 years. I've always been rather curious about India but I've never really gotten more than a cursory knowledge of it's history. I'm really glad I watched this 6-part documentary on Indian history because it really gives you a nice overview and a starting point. There is just so much bursting from the seams of Indian history that I don't envy the editors who had to choose what to cover and what to leave out. It couldn't have been an easy task. I'm a fan of history. Back before Pawn Stars, and all these new reality shows on The History Channel, I used to watch it all the time. This documentary really reminded me of the early programming they had that I could watch all day. If you like historical documentaries, you should give this one a look and learn a bit about one of the world's great civilizations. Click here to add this program to your Netflix queue. Why is it in your queue? 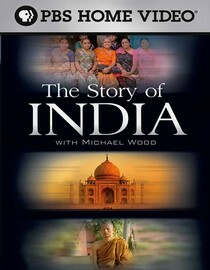 I love watching history shows and I'm also curious about India. Best thing about the movie? Getting an understanding for the depth of Indian culture. What mood should I be in to watch this movie? Ready to learn.